By LUDWIG VON KOOPA - If you want hypocrisy, look elsewhere. I'm being consistent. There is another Splatfest this Saturday in North America, making the gap between them only two weeks long as opposed to three. Are you naughty, or are you nice? Are you on Team Naughty, or on Team Nice? I thought about bucking your expectations for the heck of it, but, nah, I'll be true to myself. OF COURSE I'm on Team Naughty! I mean, come on. I don't really need to explain why, right? ...Well, I might have to. Callie is also on Team Naughty, though it's never explained why and she didn't seem to have a choice in the matter. Well, I can't (canonically) explain Callie's Team Naughty position. However, I can explain my own since you're due some explanation for someone out there. "But Ludwig!" 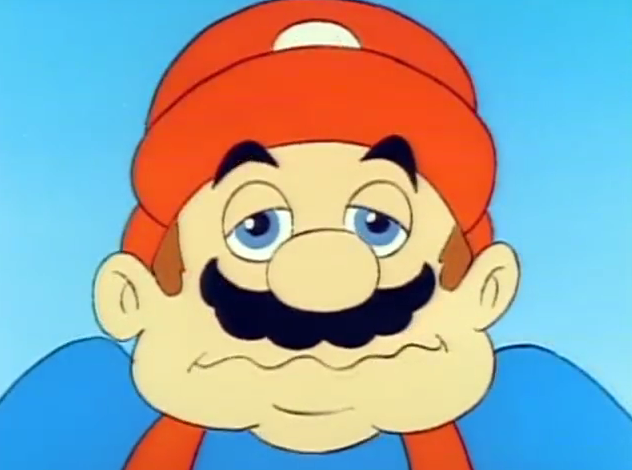 A strawman might begin, "You've been claiming for over a decade that you and Koopa Kingdom are the good guys, and Mario is evil!" Very important to note: "naughty" and "evil" aren't equivalent. They once were, but according to Wiktionary, that's been archaic for centuries! So "naughty" just means you misbehave. To misbehave means you act inappropriately or improperly. And what, exactly, should be scorned about that? I'm proud that I act not according to the "proper" ways created by these so-called "nice" people. "Nice" people just try to please. Being "nice" is literally just being agreeable and pleasant. They're the status quo. No boundaries pushed. No great things can happen under a "nice" person. You gotta step on SOMEONE's toes, and it'll be a naughty person. A naughty person ENJOYS that. Let's be specific. There's the "naughty" Koopa Kingdom. We run our kingdom like no one else. We're not traditional compared to the other kingdoms. And I think it's pretty good. Meanwhile, look at the Mushroom Kingdom. It's horribly mismanaged. The economy is in shambles. The national spirit is one of weakness. All attention in the place goes to the princess and her jerk ("nice") friends as they try to placate the failing people with really lame sports events. Nice guys finish last, you know. So King Dad never tried to be nice again. It's had some...effects on his parenting skills, let's put it that way. ...So yeah, I'm proud to be naughty. I take pleasure in it. And I like having naughty minions who take pride in their naughtiness. They tend to be motivated and perform well! You think a "nice" person is going to go far in life? Nah, they'll do the bare minimum because that's what's acceptable. And "nice" people don't think for themselves and go along to assist in evil, painting the opposite side as unjust and something that must be destroyed. Just look at what the plumber does. 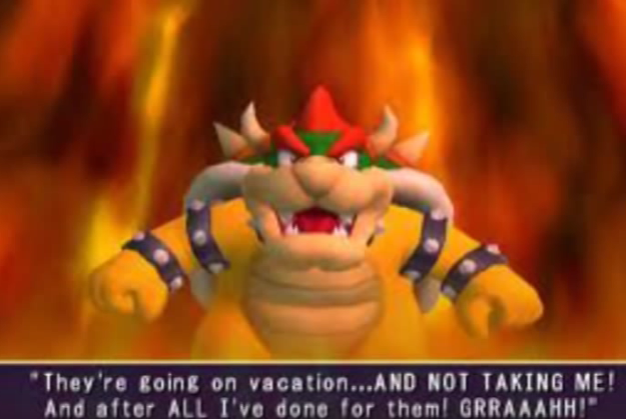 He's the real evil one, and in his world, it's the "nice" thing to do to kill thousands of Koopas. The expression of the average "nice" guy worker. Besides, naughty people bring a whole revenue stream to the noble coal industry that wouldn't otherwise exist! So yeah, I don't see naughtiness as evil or even bad. It's fun. It's chaos, something we already sided with. Naughtiness promotes individualism much more than niceness, which is aligned with the collective. I'm pretty happy with that reasoning. Are YOU a naughty person? Or are you a goody-goody nice person? Let KoopaTV know in the comments. Just know that KoopaTV viewers are more likely to be naughty. See last Splatfest: Pizza vs. Burgers! Team Naughty wins! Take that, Team Nice! We're too good! Or bad. Let's talk much more about Squidmas. Two years later: Different game, different Splatfest theme... same holiday season! Joking answer: Callie made deals with the Red Devil Cichlid. Why do you think she is winning all those Splatfests in NA? Slightly more serious answer. She does not obey the rules of Live TV so much such as wanting to get cuties to go for a ride with her. She is the more daring of the too such as wanting to give the helicopter a spin and ride the forklift. She supported Roller Coasters and Cars was also fitting because of the cuties line and that people have a bit more choice in how fast they drive their cars even if it is above the speed limit while those who are a passenger on a plane do not have that choice. She seems to like the fast life. Maybe this is why she struggled getting a driver's license. There is a Japanese quote of her in Flounder Heights where Marie says that she always gets in trouble due to being annoying which sounds a lot like how NPCs thought of your partner character in Pokemon Super Mystery Dungeon and we know the partner is not evil but can easily be called naughty due to all the rule breaking. I'm not sure how much NA would use the Japanese canon quotes but it's not a stretch if Callie would get a rush out of doing something that is not 100% within the rules in NA canon just like all those riding all those fast vehicles. Marie seems to be content with lazing around such as the Camp Triggerfish quote where she does not find the appeal of camping when she can just stay at home. Of course the insulting and the stuff is another whole league of naughtiness. The most serious answer: Splatfest topics are in order of how the phrase usually is said: "Cats and Dogs", "Autobots vs Decepticons", "Pirates vs Ninjas". Only those not in a usual phrase like "Marshmallows vs Hot Dogs" can easily really be rearranged to "Hot Dogs vs Marshmallows". "Naughty vs Nice" is said in that order so that is the way it is rearranged in the Splatfest theme. Yeah the most serious answer is the non-canon explanation. I didn't want to double post but now that you posted I can add on that Callie also said that Booty line in Pirates vs Ninjas intro and Marie wanted to keep it rated E for everyone even though this game is actually rated E 10+. There's also the Walleye Warehouse quote where Callie talks about about two Inklings in a dimly lit area and then gets interrupted by Marie for a more "cleaner" ending for the quote. It looks like Callie is trying to push the censors which may count for the Naughty side. I'm just wondering how much you'll try to hand-wave Marie's behaviour, and if you believe that Callie would ever actually acknowledge her naughtiness. 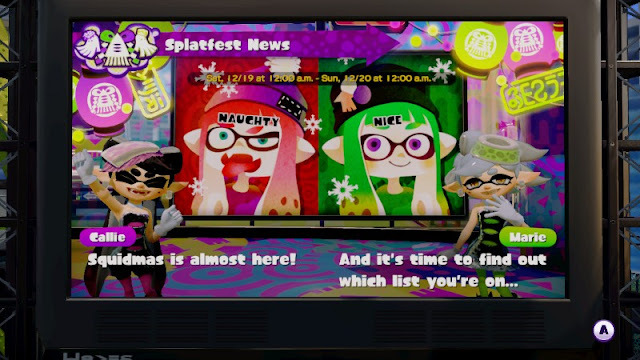 And now it is time to unwatch the Naughty vs Nice Splatfest topic. Most of it seems to be, "I'm done with Splatfest." Maybe we should let Marie win the next one to shut them up? Then again the more obnoxious supporters of that Cephalopod Cousin will come out of hiding. Hey, I've been rooting for Marie twice out of the five Splatfests since the Transformers one. I tried to get her to win! Obviously those have been the two I've lost since then.